Sometimes I wonder, Am I a terrible person? Now my reason for this is because I get a little angry, okay, maybe over angry at others who come to me and expect me to do things for them without even a hint of respect for me. Let me elaborate a little here; On twitter & Instagram I tend to get a lot of messages from other bloggers or influencers who say they want me to RT their stuff, comment on the or photos, ask me to comment on their posts, ask me to write cover letters for them to send to brand, they ask me to do loads for them without even a "Hello" and a few times it's been from someone I've never spoken to in my life. I love to support other and build them up because I believe in humans helping humans, not just women helping women. I believe in building each other up instead of tearing each other down, but, and this is the part that makes me question if I'm a terrible person or not, but, when I'm constantly asked, on a daily basis to do stuff for others and they don't even message me with kind words or ask how I am or get to know me and just expect me to do it for them, I get riled. I get annoyed. I get angry. And then I don't help them which in turn makes me feel horrible but if I stand for something like that, then it will keep happening and others will take advantage. 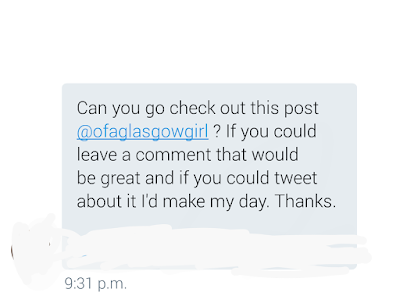 This is the kind of things I receive, I have blocked out the name and post for obvious reasons. I have no problem helping others out, I have no problem RT stuff, liking things or commenting on stuff, I do it a lot for my Friends & other bloggers I enjoy conversing with. 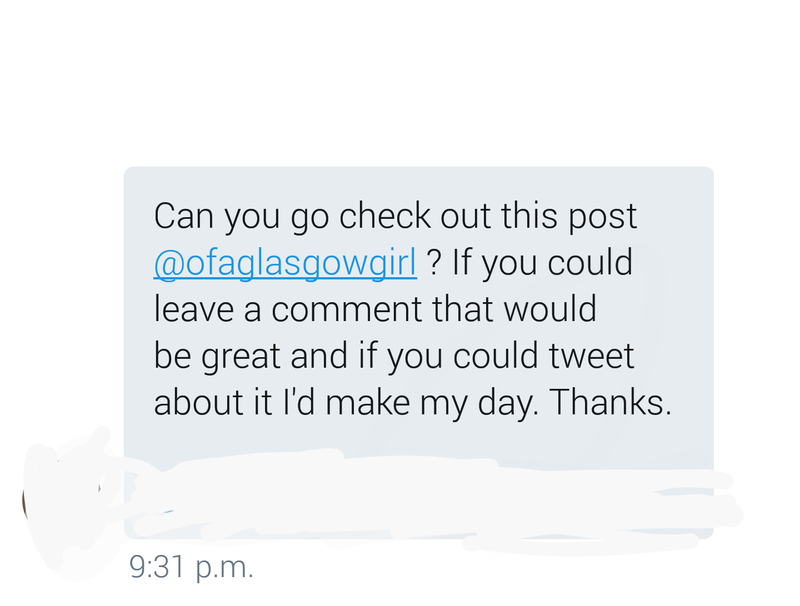 But if you've never spoken a word to me before in your whole life, then please, please do not do this. Get to know me first, make conversation and build an online friendship with me because I'm more than happy to help out in any way of you make an effort instead of expecting it. So does this make me a terrible person? Does this go against me helping others where I can? I don't know and sometimes I question myself, but it is something that gets to me. This doesn't make you a terrible person at all. I love blogging because you neet so many new and different people, you'd be happy to RT or write a comment for them. The users of the blogging world take advantage abd it's not right. I came across this post because someone else had retweeted you onto my timeline! It doesn't make you a terrible person at all as the other two people have said you have every right to get angry about it! :) Now I've discovered your blog, I look forward to reading more! You're definitely not a terrible person, Jordanne! You sound like an incredibly generous, compassionate and giving person! You're always supporting people in the blogging community and it's so wrong of people to take advantage of that! It's ok to say no and not take every single opportunity to comment / like / retweet! It doesn't mean you're a bad person, it just means you respect yourself! You 100% deserve to be thanked! Noo! 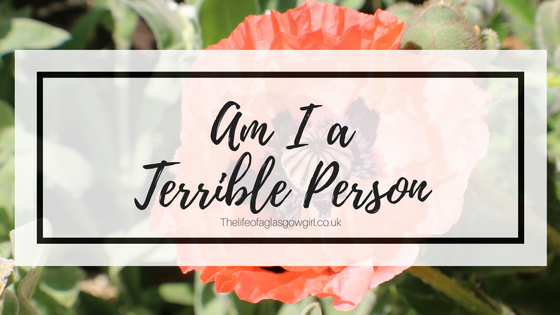 This does not make you a terrible person lovely! Surely it should work both ways. I don't expect people to like even retweet my stuff, if they do that's just a bonus and shows they love my work, I wouldn't ask for anyone to do that surely it shows you're focused around the numbers? No it doesn't make you a terrible person! I get so annoyed too, when people message me without even a 'hello' just 'check out my blog', especially if I've never spoken to them before! Like, a hi would be nice! This does not make you a terrible person at all! Now that I think about it I often ask people to like my tweets without getting to know them, which I realize is not the correct way to go about things. I am learning that if I want to succeed I have to work my way up, I cant expect every tweet and blog post to get hundreds of likes, its going to take time. All I can do is interact with others and be a genuine friend to those who reach out. Thank you so much Jordanna. That doesn't make you a terrible person whatsoever! I completely agree with your feelings on this because I would be the same way! People should expect things of others. They should build friendship, and network and I'm sure they'll get the views or comments they're looking for. I'm like you - I love helping people out but I don't like when people demand things of me.. especially when I've never spoken to them before! I would never dream of doing that! �� I can't believe the front of people sometimes, so it definitely doesn't make you a bad person! You have every right not to help strangers on the internet. You don't even have to help your friends and relatives if you don't want to (as my therapist says). People, like the ones you've described, just want to make use of your kindness without offering anything in return. Any kind of help is work and you can put a pricetag on it. I mean that asking an accountant to do your taxes for free would be rude. But doing the same thing with bloggers for whatever reason is considered okay. There are already enough opportunities in the blogging community to have your blog noticed, without being rude and basically demanding that bigger bloggers babysit you. It just takes a bit more time and effort. Definitely not a terrible person, infact one of the most inspiring and kindest persons I have met online through blogging. I genuinely look 👀 up to you and how amazing you are. You are not a terrible person and I don't think you are asking for much by wanting for people to get to know you a little first. Part of the reason why I respect you as a blogger is because of how kind and supportive you are but I also believe that has to work 2 ways. The fact that you even intend on supporting others shows you are kind and not terrible! There was a great Dear Sugars podcast a couple months ago with Oprah Winfrey talking about this very thing and leaning to say no. It’s worth a listen. With success will always come people who want to take advantage and ride your coat tails! Learning to handle it is a gift. Not a terrible person at all!